CONVERSABLE ECONOMIST: How Does China's Higher GDP Translate into National Power? How Does China's Higher GDP Translate into National Power? Beckley argues that most scholarly studies of international power focus on overall gross indicators like size of GDP, but that this approach can be misleading. He argues instead for a measure of power that combines GDP and per capita GDP, where the second measure is a rough way of capturing the efficiency with which a society employs its resources. By this admittedly rough-and-ready measure, the US remains much more powerful than China, thanks to its much higher productivity levels. Standard gross indicators are not good enough; they are logically unsound and empirically unreliable, severely mischaracterizing the balance of power in numerous cases, including in some of the most consequential geopolitical events in modern history. ... The hype about China’s rise, however, has been based largely on gross indicators that ignore costs. When costs are accounted for, it becomes clear that the United States’ economic and military lead over China is much larger than typically assumed—and the trends are mostly in America’s favor. 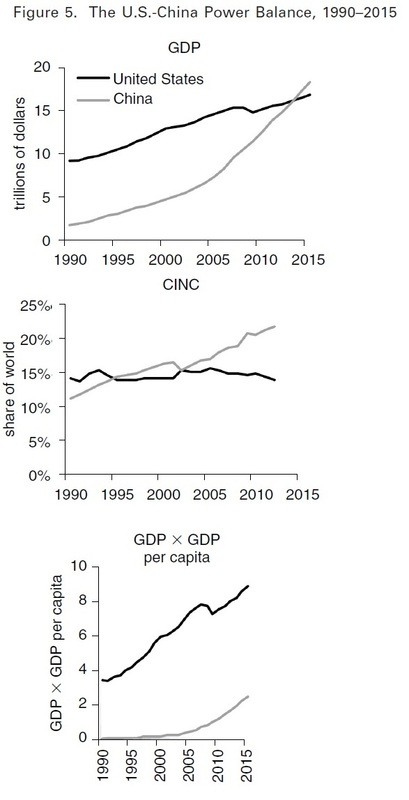 To create a rough proxy for net resources, I follow Bairoch’s advice by simply multiplying GDP by GDP per capita, creating an index that gives equal weight to a nation’s gross output and its output per person. ... Future studies can experiment with ways to improve this measure by adjusting the weights or, even better, by expanding the databases created by the World Bank and the United Nations or developing new measures of net stocks of resources. 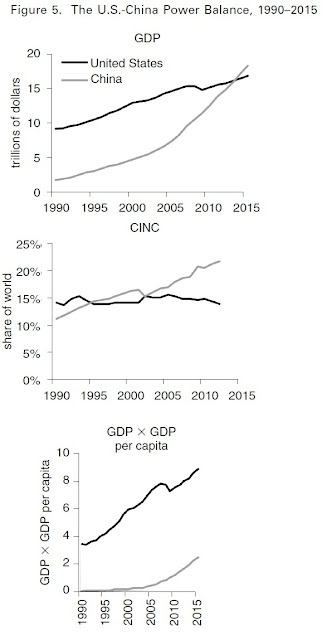 For now, however, multiplying GDP by GDP per capita yields a primitive proxy that scholars can use to evaluate the importance of net resources in international politics. Beckley applies this measure of power to a number of major international conflicts in the past that would otherwise be perplexing. One example is the conflicts between Britain and China from 1839-1911. China's GDP and defense budget were more than twice the size of Britain's, and yet Britain kept winning the battles. But China was a low-income country. "By standard indicators, China looked like a superpower in the nineteenth and early twentieth centuries. It had the largest GDP and military in the world until the 1890s, and the second largest GDP and military until the 1930s. During this time, however, China suffered a “century of humiliation” in which it lost significant territory and most of its sovereign rights, fighting at least a dozen wars on its home soil—and losing every single one of them." "OSince the 1990s, and especially since the 2008 financial crisis, hundreds of books and thousands of articles and reports have asserted that the United States’ economic and military edge over other nations is eroding and that the world will soon become multipolar. The main evidence typically cited for these trends is China’s rising GDP and military spending and various statistics that are essentially subcomponents of GDP—most notably, China’s massive manufacturing output; volume of exports; trade surplus with the United States; infrastructure spending; consumer spending; and large government bureaucracy and scientiªc establishment. The problem, however, is that these are the same gross indicators that made China look like a superpower during its century of humiliation: in the mid-1800s, China had the world’s largest economy and military; led the world in manufacturing output; ran a trade surplus with Britain; presided over a tributary system that extended Chinese trade and investment, infrastructure projects, and soft power across continental East Asia; and was celebrated in the West for its consumer market potential and tradition of bureaucratic competence and scientific ingenuity. Obviously China is not as weak today as it was in the nineteenth century, but neither is it as powerful as its gross resources suggest. China may have the world’s biggest economy and military, but it also leads the world in debt; resource consumption; pollution; useless infrastructure and wasted industrial capacity; scientiªc fraud; internal security spending; border disputes; and populations of invalids, geriatrics, and pensioners. China also uses seven times the input to generate a given level of economic output as the United States and is surrounded by nineteen countries, most of which are hostile toward China, politically unstable, or both. Accounting for even a fraction of these production, welfare, and security costs substantially reduces the significance of China’s rise. For a rough image the US-China power balance by different metrics, the first figure compares GDP. The second figure is the CINC measurement mentioned above. The third figure multiplies the size of GDP by per capita GDP. In this third sense, the US remains far more powerful than China. 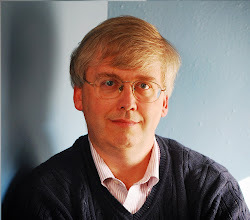 The world is in the process of shifting from a situation in which the largest economies also tend to be high in per capita GDP to a situation in which many of the largest economies are populous middle-income countries, so Beckley's argument matters a lot.